These posts cover cheesy items that were tried at a restaurant. When it’s the kind of day where everything has gone wrong before 10 am, my co-workers and I always have a go to lunch spot in Tempe. Salut Kitchen and Wine Bar is hidden in a shopping complex but is the best surprise to find. 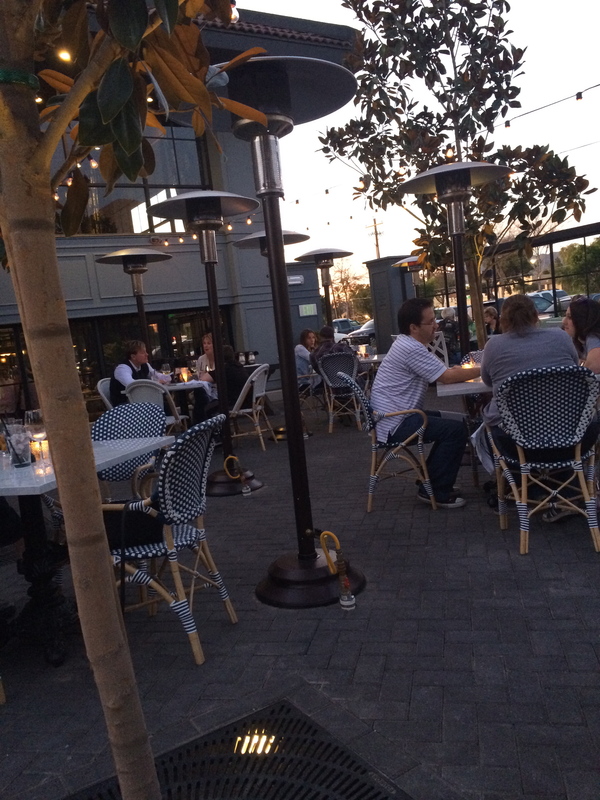 The restaurant has a large patio with whimsical garden lights and reclaimed wood tables. 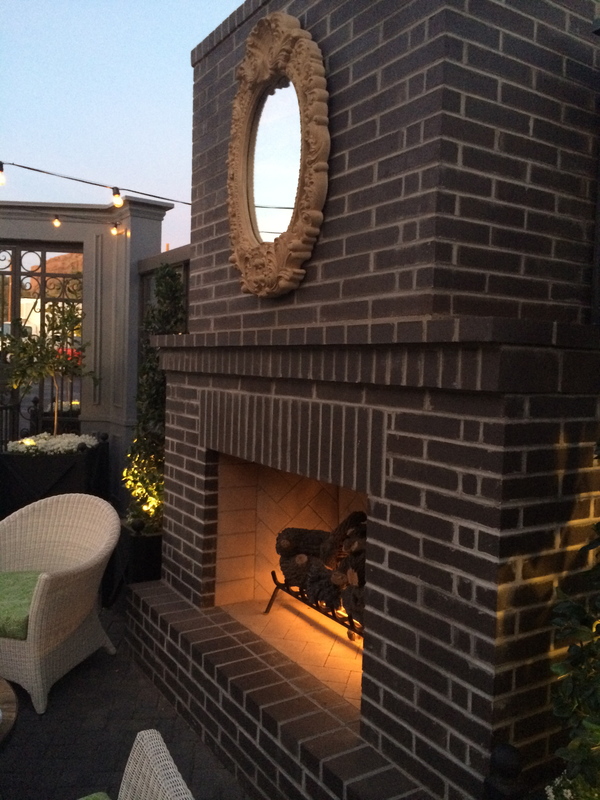 This is my favorite spot (before the weather turns into the pits of doom) to relax with a glass of Bodini Malbec and eat away. Salut has lots of delicious salads and sandwiches that I like to choose from, but there is nothing better than lounging while eating their Hummus Nachos. The dish itself its just pretty to look at, let alone eat. So many of my favorite things are made on these individual pita triangles: homemade hummus, red onion, pomegranate seeds, balsamic reduction and a sprinkle of creamy feta. Feta isn’t the only dairy love this menu encompasses. There is a simple Caprese Salad that I love enjoying on a hot Arizona day. Lots of bruschetta choices, with my favorite being the FIG with mascarpone, proscuitto, figs and salty pistachios. And last but not least, the Bacon Grilled Cheese. The sandwiches at salut can be made panini style with foccacia bread, which creates an even crispier crust. There is a mix of honey butter and garlic aioli that is spread on the bread and it creates a comforting finish to the cheesy sandwich. Salut is located on on University west of McClintock. They have a great Happy Hour that you won’t want to miss. A daily occurrence from 3-6:30 pm and reverse happy hour Sunday through Thursday from 9pm – Close. 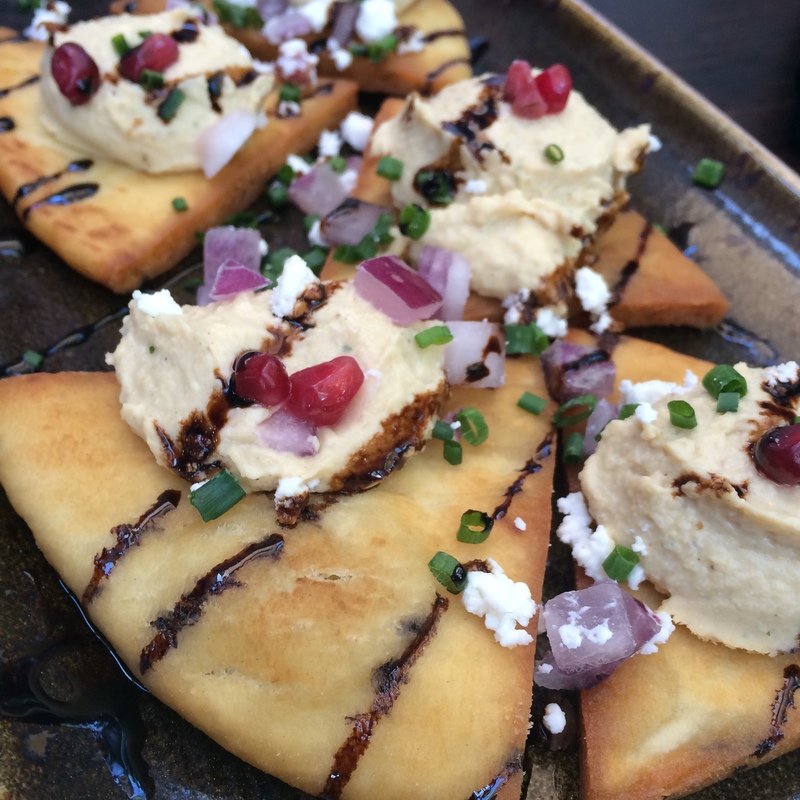 You can grab the Hummus Nachos for only $6.50 and a glass of house wine for $5, an easy justification to go try. Last weekend some co-workers and I got our stretch on for a 5k run. The run was organized by a junior high student with all proceeds benefitting our non-profit client, Childhelp. The turn out and weather were both great for a day of running, walking and supporting a local organization. In good athlete fashion, we of course needed to celebrate with lunch and mimosas after our 3 mile run! The run began and ended at a local pub called Spoke & Wheel. On weekends they have brunch and a Bloody Mary bar. 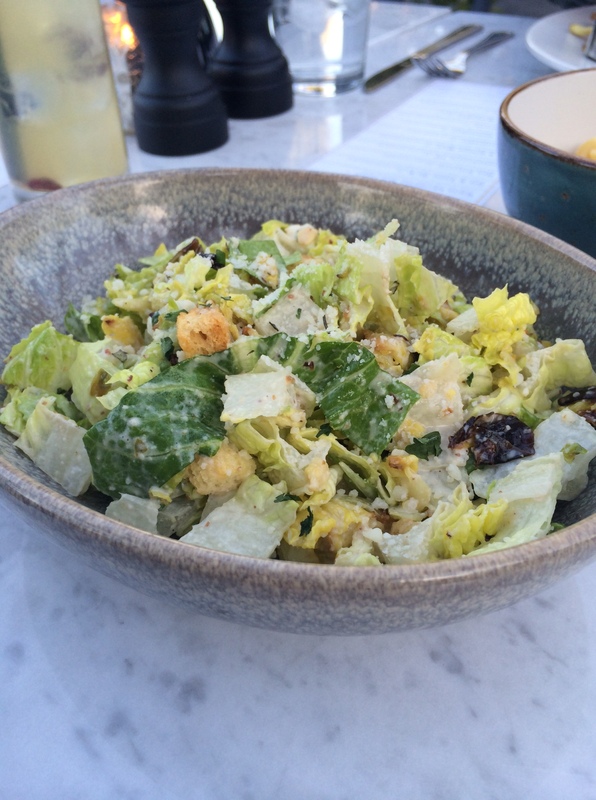 Along with the juicy burger, you could chose from their long list of delicious sides. What else was on the list? Mac and Cheese of course! This delicious pasta came in a mini pot and was filled to the brim. My husband loves pizza. Let’s be honest, because so do I. But, sometimes I want a little healthier option when we make at home, so we compromise with a favorite recipe we have. This pesto chicken CHEESY pizza, is easy to whip up on a night when you don’t have a whole lot of time to cook. Pesto sauce (I usually make my own with basil, EVO, garlic, Parmesan, & pine nuts, but opted for store bought this time). Spread the pesto sauce on the pizza dough. Layer the cheese. Add the chicken, corn & spinach. ADD MORE MOZZARELLA. I sprinkle some more pesto on top to keep the pizza saucy. Read the pizza dough instructions for cooking time. Usually 12-15 minutes at 350 degrees. This pizza would also be good with some red or yellow chopped bell pepper, leeks and/or purple onion if you want to add even more veggies! I’m not a huge fan of seafood, but if my husband has a craving, our best bet is to make a trip to Scottsdale Quarter for Eddie V’s. I don’t complain because they have a good selection of steaks and TRUFFLED macaroni and cheese. Die. 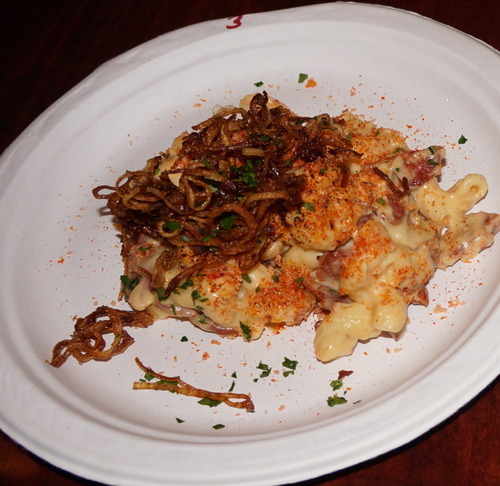 I sometimes feel that Donovan would shake his head for me sneaking around his back with Eddie, so I have to say, Donovan’s is still my favorite for my steakhouse macaroni. 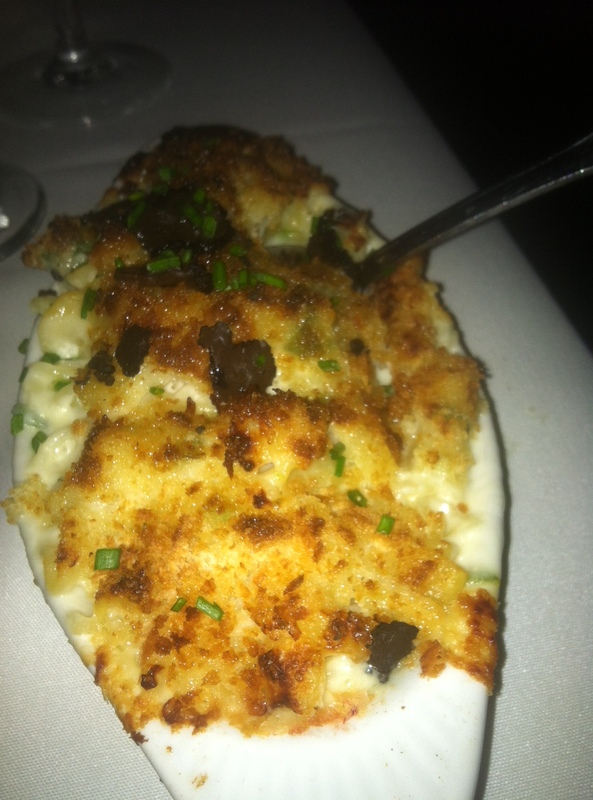 But, the black truffle addition on Eddie’s menu item switches it up and gives this dish a super savory taste. Lucky for you, I found a copy cat recipe on tastebook.com so you can try at home for yourself. 1. Start by making the bechamel sauce. Bring two cups of whole milk to a simmer in a medium sauce pan. Stir constantly to avoid scorching. In a separate sauce pan melt 3 tablespoons butter. Whisk in 3 tablespoons all purpose flour to form a roux. Incorporate the roux with the hot milk and continue to stir until it thickens, about 5 minutes. Season with salt and pepper to taste and 1 tsp. nutmeg. 2. Combine the bechamel sauce with all of the other ingredients except for the truffles and panko crumbs. Place 2 cups of mixture into each of the 6 oven proof dishes. Bake at 400 degrees until the macaroni bubbles. Remove from the oven and sprinkle with panko. Return to the oven for 5 more minutes. After taking out of oven, sprinkle with the truffles and serve immediately. When a friend moved to Dublin for work and asked if we wanted to come visit, there was no other thought in our heads than to book flights and head to the beautiful and historic county. and of course took in all that Downtown Dublin had to offer. On St. Patty’s day (yes the celebrate it there like us, and yes it was way more awesome), we held up the white flag after 10 hours of drinking Guinness and waiting in 30 minute toilet lines to head inside and grab a seat to eat. 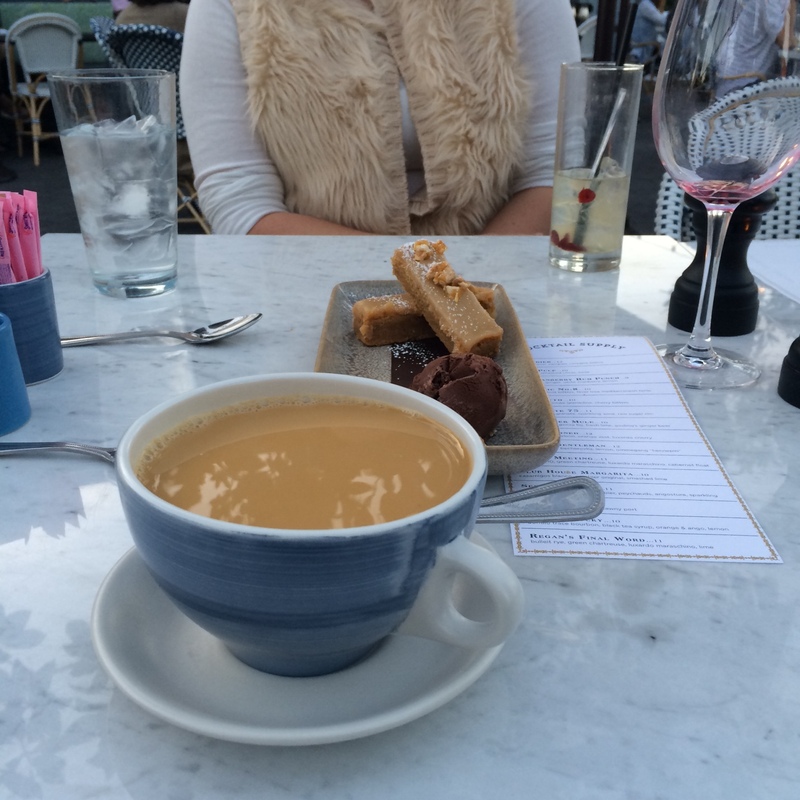 We were told we had to visit Fade St. Social for the tapas and a modern take on Irish foods. We sat at a community dining table in the Gastro Bar section of the restaurant, as there were some different items on the menu that we wanted to try and were not exactly dressed or in an appropriate state of mind to sit in the cushy dining room. We ordered an embarrassing amount of tapas and soaked up St. Patty’s Day. Favorites were the fries, lobster roll and pork belly. 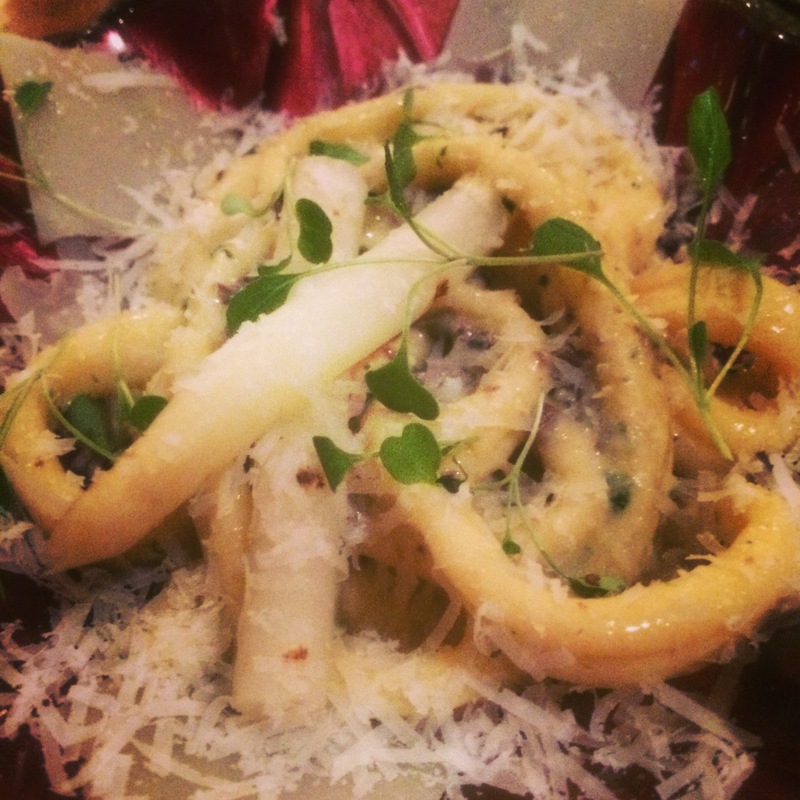 My favorite of course, was the Truffle pasta with charred white asparagus and fresh Parmesan. The noodles were hand rolled and thick. 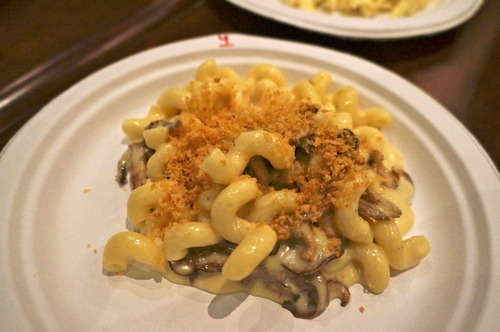 Thankfully, the Parmesan stuck to all sides of the firm noodles with a creamy white sauce. Even at tapas size, it was enough to help cure my next day hangover that was coming on. At night, the restaurant turns into Forchetta, the Irish take on Italian Cuisine. I only say this because certain ingredients were replaced by Irish items that you wouldn’t normally see in a true Italian restaurant. 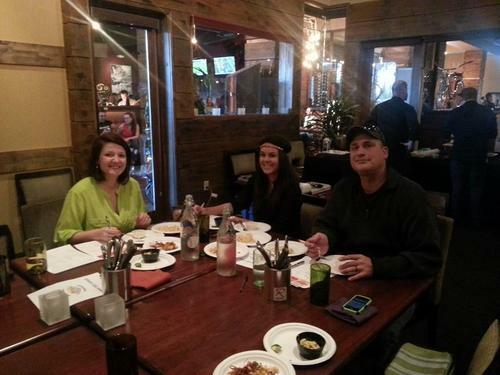 But as usual, The Scott’s couldn’t resist the thought of pasta, salads and breads. We started with Pane all’ Aglio con Mozzarella or garlic bread topped with mozzarella. The presentation for the simple bread was the best that I’ve seen. We continued with the Rucola or an arugula salad with balsamic and Parmesan. We heard the Frittura di Calamari e Gamberi was a must try, so we did. It was worth being almost full before our entrees came. 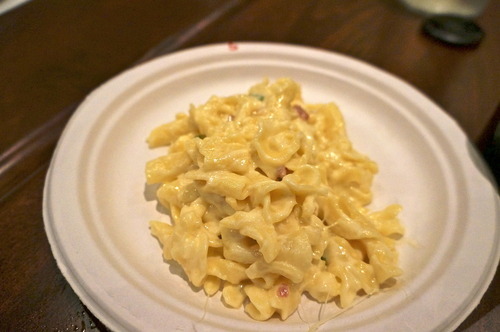 In true, More Chz Plz fashion, I ordered a creamy pasta for my entree; Tagliatelle Speck Gorgonzola e Noci. 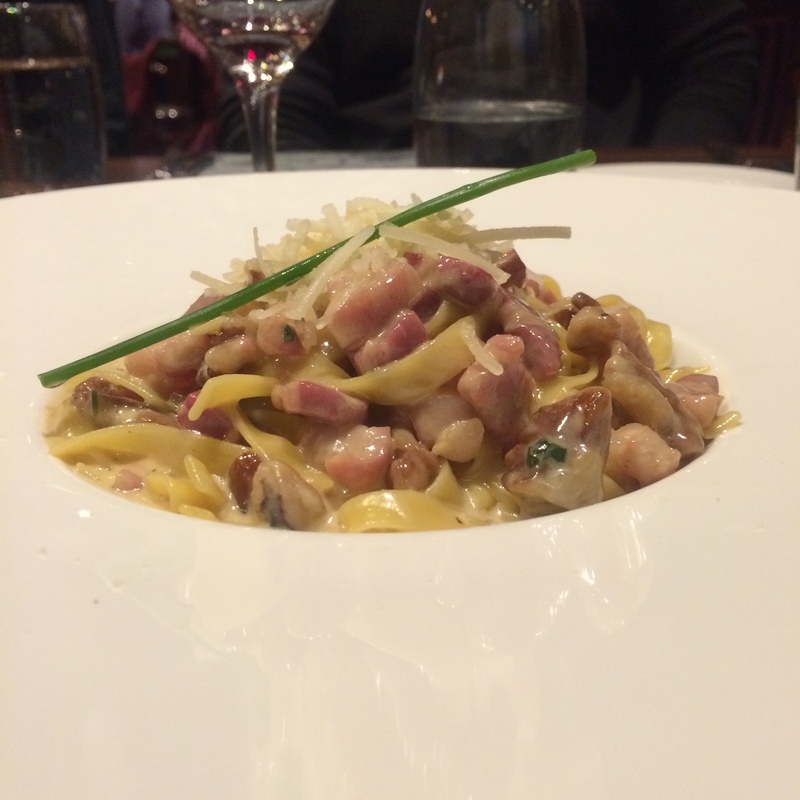 The ribbon pasta was thin and weaved its way back and forth through a pool of Gorgonzola cheese sauce, thick cuts of speck and walnuts. The small bowl was deceiving as I began to “forchetta” the pasta into my mouth. The opposing elements seemed to work together, with an earthy taste from the walnuts. The cheesy sauce was incredibly rich, but still didn’t stop me from adding Parmesan on top. For an Italian restaurant in Dublin, I left happy and full. The trip was an overall amazing experience and I recommend to anyone who wants to get a feel for Europe in a less busy town. Everywhere we went, people were enamored because we were Americans (unlike some of our experiences in Italy). Since Dublin is capital, the city seemed a bit more expensive, but overall it was worth the spend. 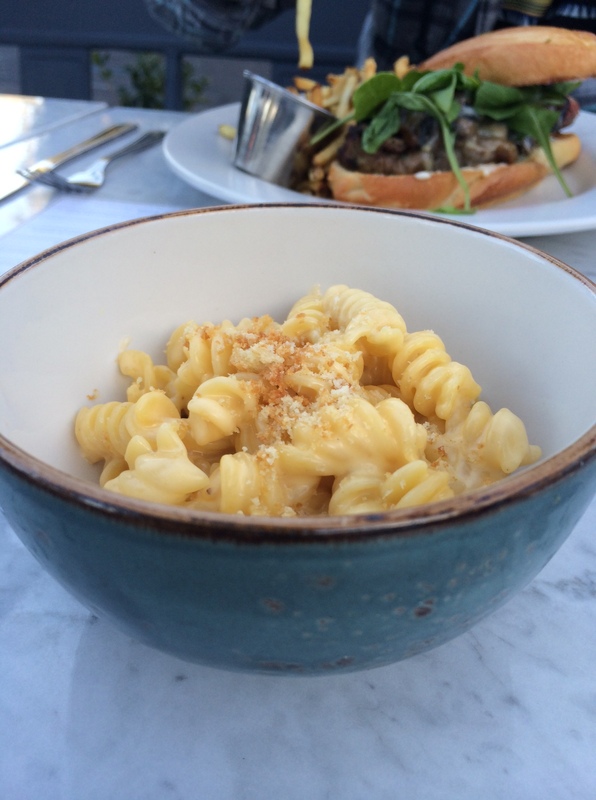 The Henry – Side of Mac and Cheese with Brussels Sprouts, Plz. Walking in you are overwhelmed by amount of people and the directions to start walking, so we made an easy decision. Food. 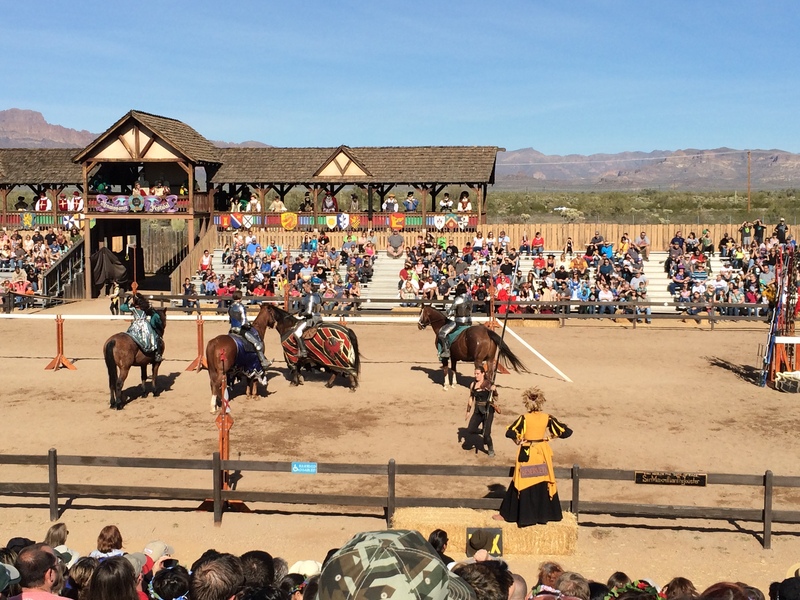 After a day of medieval trinket shopping, some singing nuns, jousting and too many over-exposed chests, we headed out. Why of course I do, best husband ever! We get to The Henry, which might I add has bountiful amounts of parking, and right away I feel like I’m at a Napa restaurant. The patio that is visible from the parking lot has a Modern Steak vibe (A previous FRC restaurant blogged about last year), but definitely updated in style. The inside is perfect for a “work-out-of-the-office” day, a bar to the watch the game and grab a bite spot, or a laid back “let’s get a quick drink on their couch” date. The inside was already packed at 6 pm, so we opted for the beautiful patio since we were blessed with a perfect day of AZ weather. After a day of royal indulgences, I wasn’t starving, but was definitely parched. 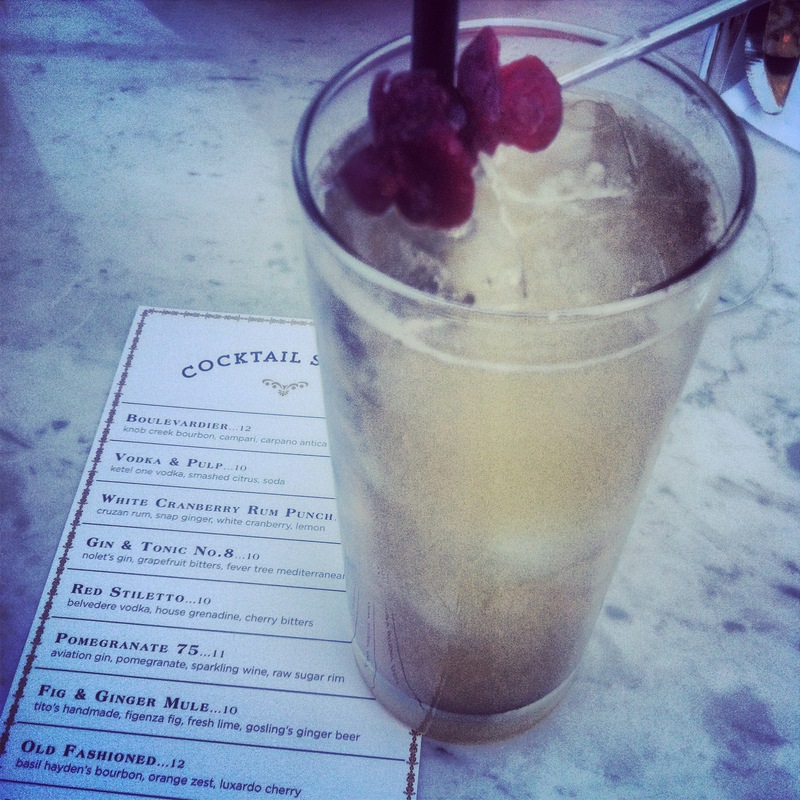 I opted for a cocktail – the White Cranberry Rum Punch to be exact. It was packed with rum and had a bittersweet punch that will be perfect for The Henry’s summer diners. Next on the list was getting some veggies in me after all of the savory foods at the festival. Pretty much every restaurant that touts seasonal dishes has Brussels Sprouts on their menu right now. This has made me learn that I actually don’t mind the ball of green. The Henry has incorporated the cholesterol-lowering veggie into a Caesar salad on the menu. Caesar dressings can be either a hit or miss with me, but I wanted to give it a try. The dressing was creamy, yet light and the Brussels Sprouts were roasted and chopped to blend in with the romaine. The dark green mixed with the Chartreuse made this salad so fresh looking. There were thick slices of Parmesan Cheese to top it off. I wasn’t satisfied with only some Parmesan, so ordered a side of the Mac and Cheese that I spotted in the picnic side options for the roasted half chicken dish. This side was the perfect size to help me quiet my urge. 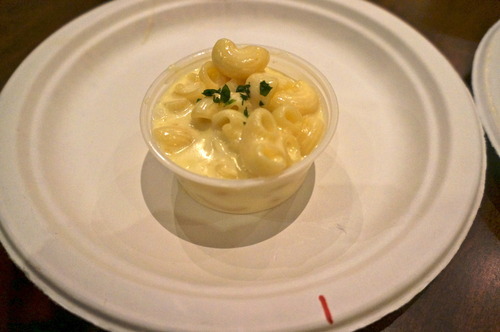 The Parmesan, White Cheddar and Asiago were all blended to create a thick coat for the rotini pasta. 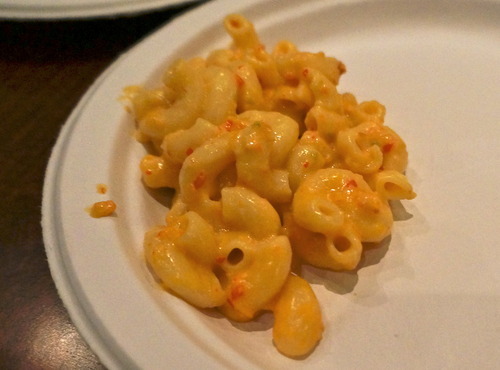 The mix of cheese was a great hit, but as we all know, I am a sucker for super creamy mac and cheeses. But, with all the fresh and seasonal veggies that they had on this menu (Vegetarians, this menu would be heaven for you), I could see this dish being brought to the main menu with some colorful additions such as Brussels Sprouts, Kale or Artichoke Hearts. Full stomachs or not, we had to end the meal with the home made Peanut Butter Bars and Chocolate Ice Cream dessert that The Henry’s Coffee Shop, XV had on the menu that day. The pastries are always changing; so don’t fall too in love with only one dessert! My next visit I will be sure to come on an empty stomach because the Brie Toast (roasted pear, pomegranate & hazelnut), Heirloom Quinoa Tacos, and Long Bone Short Rib dishes caught my eye! 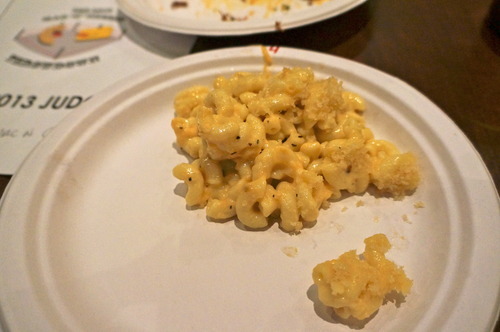 I officially have a mac and cheese food baby after last nights 2013 Mac and Cheese Throwdown. I was fortunate enough to be voted as the third judge for the competition. 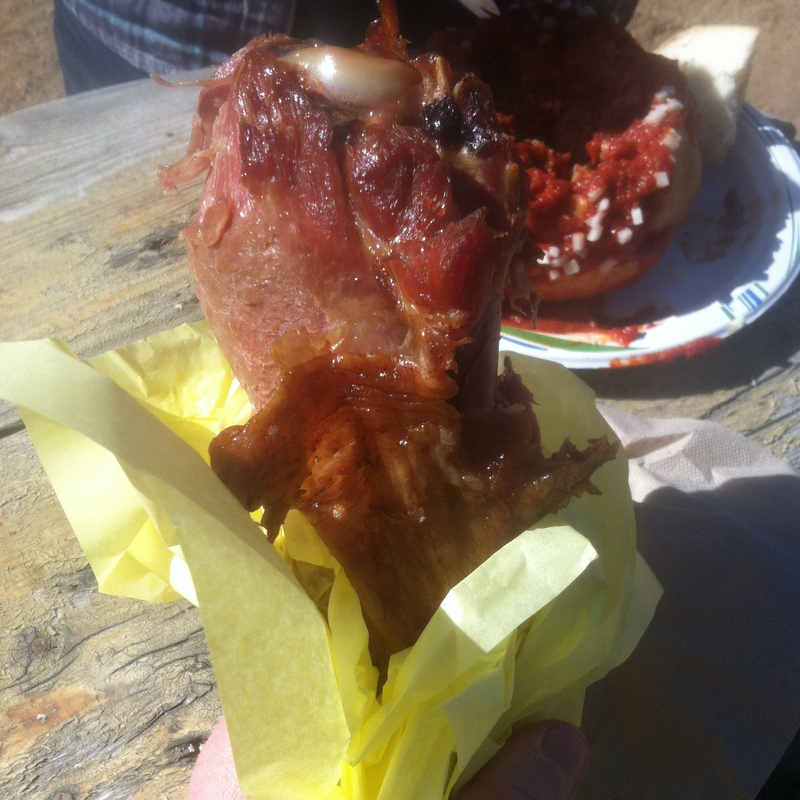 I met two great food influencers in the Valley, Aaron from go lb. 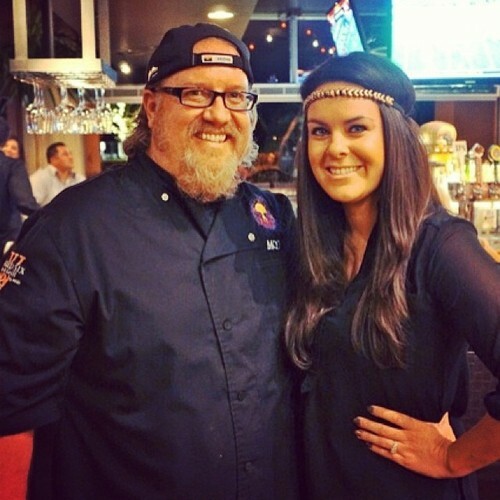 salt & Joanie from Restaurant Live AZ, who were the other two judges of the night. After being told by our Judge Nazi, Susie (Girl Meats Fork), that we had to sit and eat, I got into my mac and cheese swing. There were 10 chefs and we were not told who created which dish. 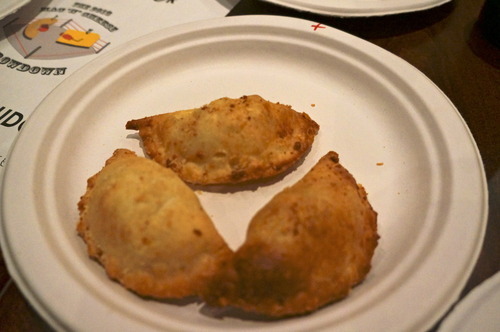 The judging was based on taste, cheesiness, consistency and creativity. White truffle scented with San Joaquin Gold Mac & Cheese. 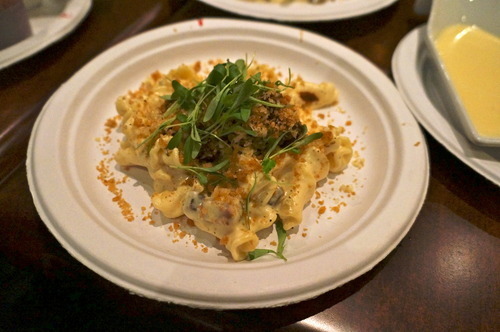 Rangoon style mac and cheese with chinese sausage, foie, edamame, dried cherries, cream cheese and veleveeta. 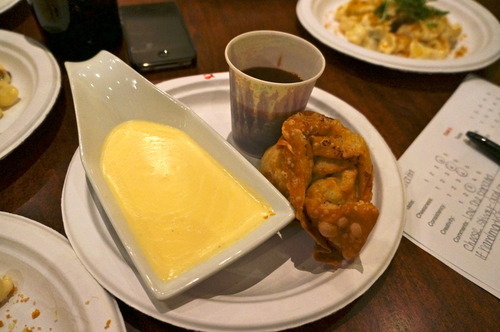 It came with a cheese dipping sauce as well as a drizzle of cherry sauce. 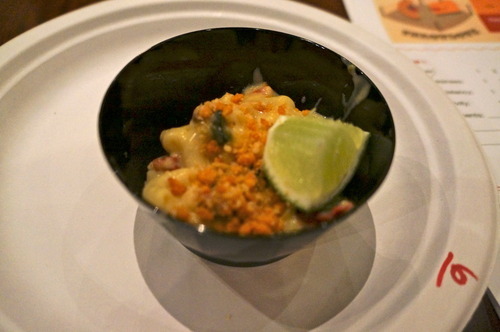 Southwest mac & cheese with hatch green chilies, smoked corn, oven-dried tomatoes, double-cream gouda, shepard’s hope cheese, and a squeeze of lime, topped with a cheddar cracker crumb. Finally meeting Chef Michael O’Dowd! Thanks to all the chefs who participated and rocked the event! I can’t wait until next year!